SAN FRANCISCO--(BUSINESS WIRE)--May 10, 2018-- Visa (NYSE:V), the Official Payment Services Partner of FIFA, today announced that professional footballer and face of Visa’s 2018 FIFA World Cup Russia™ global marketing campaign, Zlatan Ibrahimović, will return to the tournament with Visa and join football fans in Russia this summer. Whether traveling to the tournament or watching from home, Visa’s fast and easy payments will help fans catch every moment of the FIFA World Cup™. In Russia, fans will spend less time in line and more time focused on the pitch, by utilizing the more than 3,500 point-of-sale terminals and 1,000 mobile concessionaires that have been equipped with the latest in payment innovation – whether it is a dip, tap or swipe. Fans at home can also join in on match-time excitement through the eyes of Zlatan armed with Visa’s exclusive access during the tournament. Visa’s FIFA World Cup™ campaign, “Visa's Ultimate FIFA World Cup™ FOMO” will document Zlatan’s journey to the tournament and his return to the FIFA World Cup™ stage, showcasing the ease of contactless payment technology throughout his adventure. 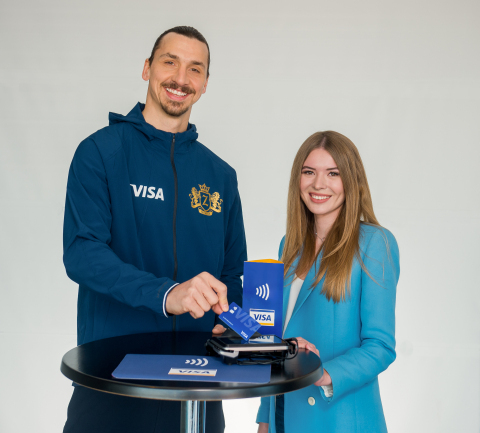 Visa and Zlatan will help fans defeat FIFA World Cup™ FOMO by offering a glimpse into what takes place behind-the-scenes at the world’s largest sporting event, leveraging Visa’s exclusive access to the centre circle and team warm-ups prior to official matches. Zlatan is joined by a top roster of global social media influencers to ensure all fan FOMO is defeated. A first for Visa, the five football, lifestyle and fashion influencers – representing Germany (freekickerz), Japan (Kotaro Tokuda), Mexico (Pamela Allier), United Kingdom (Chris MD) and Russia (Tatiana Vasilieva) – will serve an integral role within Visa’s global marketing campaign. Several influencers will be featured throughout different campaign films and give their millions of followers insight into how Visa’s innovative payment technology and exclusive access helps keep fans connected to the tournament. Shot by award-winning directors, Traktor, the creative campaign follows Zlatan’s journey back to the FIFA World Cup™. Developed globally and shot in the United Kingdom, the campaign features a combination of more than 20 hero and social films, and spans television broadcast, digital, video, social, print and out of home. For the latest news around Visa’s FIFA World Cup™ activities, engage in the conversation at #PayLikeZlatan, join Visa at @Visa_US and Zlatan’s 31 million followers on Instagram at @iamzlatanibrahimovic or visit Visa.com.